This morning I felt my shoulder being gently stroked and a deep voice saying Sheryl. I woke up and told my husband thank goodness you woke me up, I was locked into a dumb dream. He needed a bandage change because it had been the allotted 12 hours since the last change. It's funny how you can find your coffee mug with your eyes shut but find it I did and I slowly started to wake up. The coffee song floating through my head, Folgers in your Cuppppppp. Sing to me Mr. Coffee. I open up Facebook to see if any more pictures of family from my son and his wife's house and see a couple more. Only seeing a couple more not realizing, I'm talking out loud, I voice my thoughts. Where are all the pictures? My always helpful husband has already picked up our phone, looking through the menu for my daughter's number, finds it, hands it to me. The conclusion. I find out they are driving home which will take 6 hours and the picture taking was kept to a minimum. I tell my daughter now we know what a Mom Call is both of us chuckling. Husband concludes stating good-naturedly, "Not everyone takes pictures like the paparazzi honey". I just checked and there's a picture. 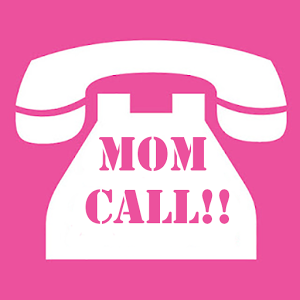 Power to the "Mom Call".